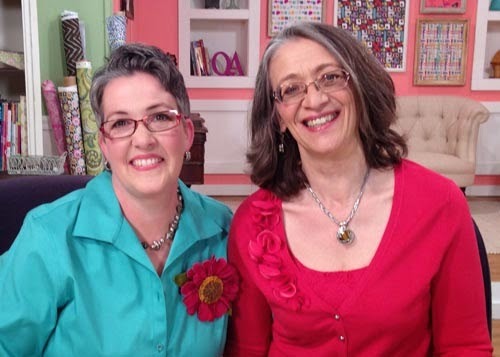 I’ve admired Sue Reno’s work in exhibitions for years, wondered about her techniques and swooned over her fabulous echo quilting, but I first got to know her when she came to Quilting Arts TV to shoot several several segments for Series 1400. 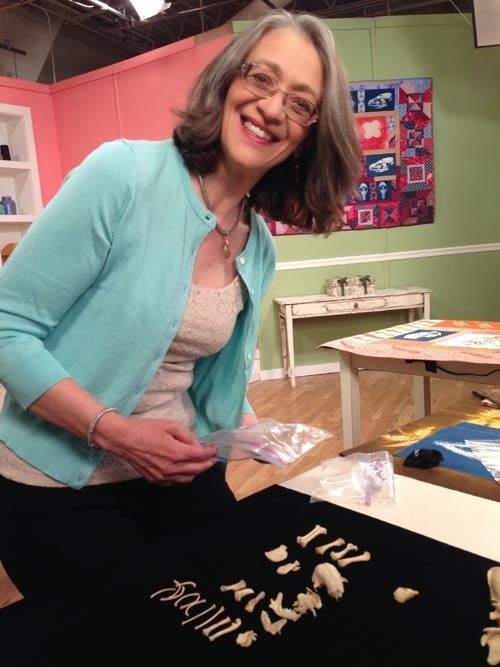 In Episode 1404, “Inspired by Nature,” she shows how plants, animal skeletons and photography inspires her work. In episode 1410, “Quilting Medley,” she demonstrates her trademark echo quilting. 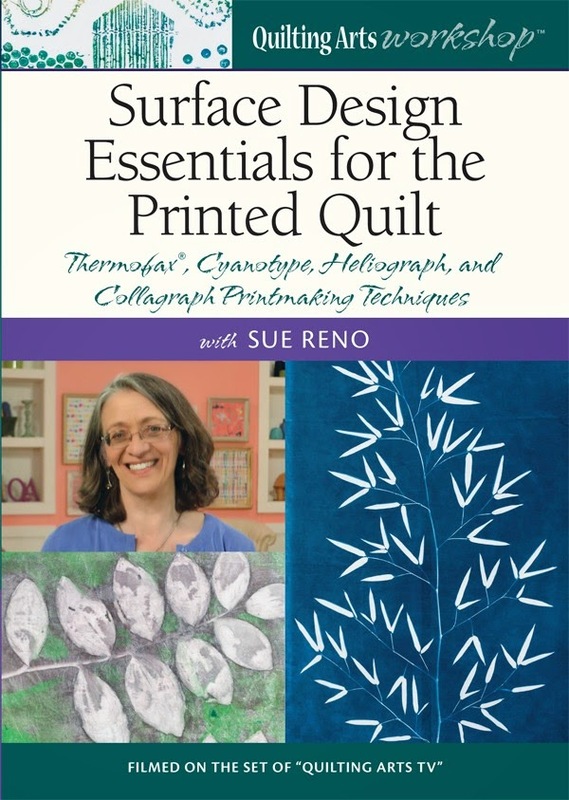 While she was on set in March 2014, she also shot a Quilting Arts Workshop, “Surface Design Essentials for the Printed Quilt.” It is now available as both a DVD ($24.99) or a digital download ($19.99) from the Quilting Daily Shop. I watched it yesterday, and now I can barely contain my excitement. I want to run out right now and buy a few supplies, and get started. I want to make cyanotype prints, heliographic sun prints, Thermofax®, and collagraph prints. I want to play! These are techniques I’ve been wanting to try forever, so why haven’t I? Maybe because I didn’t know exactly what to do. Maybe I was a bit intimidated. But not anymore! Sue’s patient, concise explanations and demonstrations make everything perfectly clear, and very easy to understand. I think I’ll be trying all of these techniques, and incorporating them in my future work. 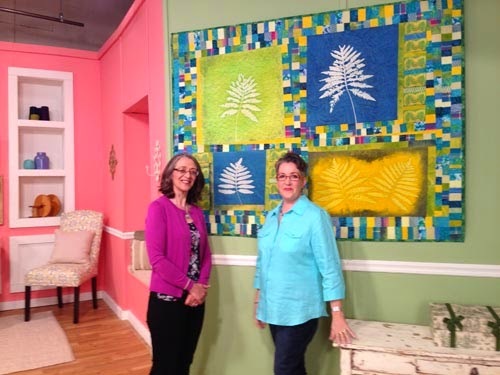 Sue with me, in front of one of her larger pieces. Sue covers a different technique in four of the “chapters” in her Workshop. She shows how to make cyanotypes, gorgeous blue-and-white prints, using plant materials (I’m eager to try both plants and objects to print!) and pre-prepared, purchased cyanotype fabric. 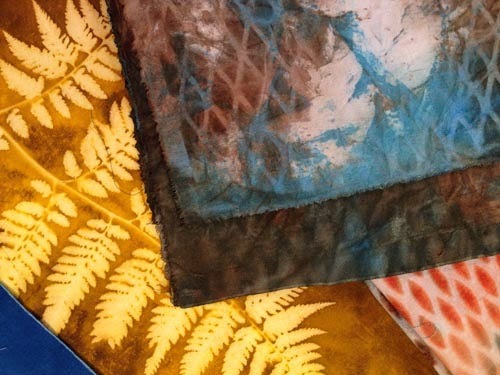 Then she covers heliographic prints, using watered-down transparent textile paint and the power of the sun; and collographs using a reusable Gelli Plate. Last, she explains how to prepare original photographs, and have them made into Thermofax® screens, and shows how to screen print from them. Along the way, she shares her knowledge about good design, and practical tips for making the techniques easier. At the end of the Workshop, she shows examples of her work that she made from fabrics using these techniques, while explaining her composition, design and quilting decisions. If you are like me – curious about these techniques, but not knowing how to get started, this is the Workshop for you! I highly recommend it if you want to work with these surface design materials. Several other artists are participating in a blog hop to launch Sue’s workshop. You can read their posts by following the links below! and oh!… a giveaway! Leave a comment after this post, telling me about a handmade gift you made, or about a surface design technique you’d like to try. At 6 p.m. EST on Nov. 14, I’ll draw one name at random. 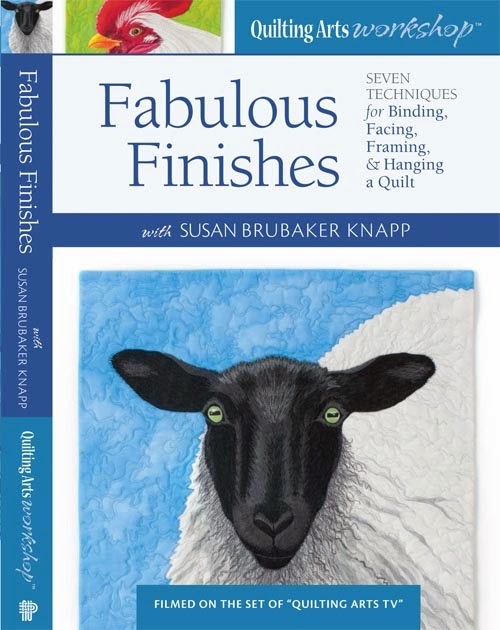 The winner will receive a copy of my latest Quilting Arts Workshop, “Fabulous Finishes.” Make sure you leave me your e-mail address, or some way to reach you. We have a winner! Juliefeldhaus has won. Thanks for reading, everyone!